No previous appliqué knowledge is required, and this class is suitable for confident beginners as well as more seasoned quilters. Some experience with free-motion quilting and binding is useful, as this part will be largely done without guidance. In this class you will learn the turned-edge appliqué method with glue and freezer paper, a fun way of piecing where sewing is optional and the supplies are inexpensive. You can even compose your quilts on your sofa, instead of by your machine. 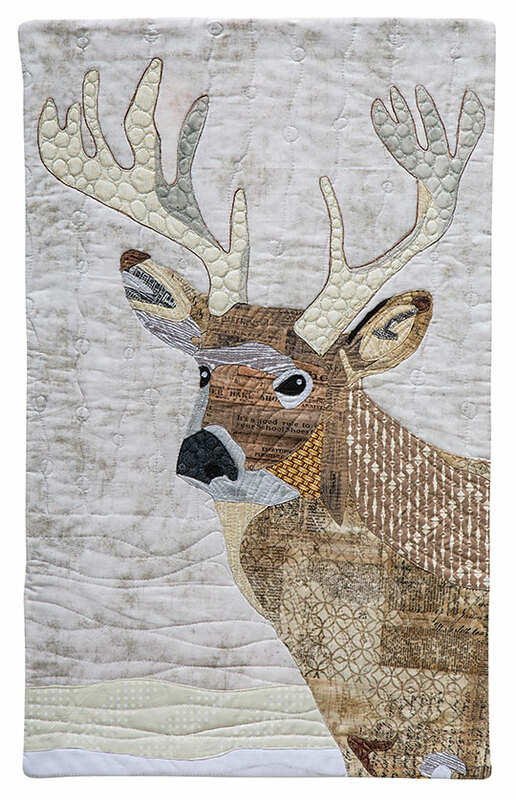 You will also learn about choosing fabrics for making contemporary-style animal portraits and easy free-motion quilting following nature’s lead. At the end of the class, you will have a pieced, basted, and mostly quilted small wallhanging. 3 classes, 3 hours in length. Homework will be needed between classes 2 and 3. In class 1, you will pick fabrics together, either as a shopping exercise (for a total of around 3 ½ yards depending on the store’s minimum cut) and/or curating the stash of the students. An ironing station between two students is especially useful in classes 1 (if you have quick students) and 2. Students will require a double workspace in which to comfortably draw their templates and piece their deer. Look at the fabrics brought in by students or shop for fabric referring to the color key and pp. 8–9. Lay out and make sure there is enough variety in shade before making final decisions. Trace the pattern onto freezer paper with a permanent marker, note color references, and make alignment marks (p. 10). Build the appliqué, following pp. 11–13. Discuss stitching (p. 14), although this class plan is written with the assumption that students will not be piecing by machine. Project will need to be finished at home before class 3 if not completed in the allotted time. Spray starch and press quilt to make larger areas more rigid and less prone to shifting when quilting. Quilt according to pp. 28–29. Your students will likely need to finish the quilting and apply binding at home.